Stop us if you’ve heard this one before: Two balalaikas, a domra and a button accordion walk into one of the largest and most prestigious chamber music competitions in the world…and walk away with the top prize. 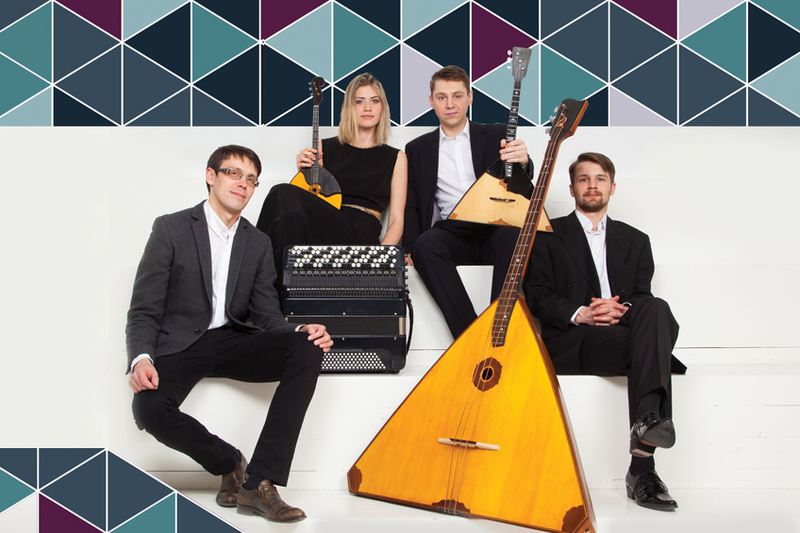 This is how the ensemble Russian Renaissance came to be known worldwide as an exhilarating quartet that defies the stereotyped expectations of their folk instruments to perform works ranging from traditional melodies to tango, jazz and rock ‘n’ roll. Musicians Ivan Kuznetsov, Anastasia Zakharova, Alexander Tarasov and Ivan Vinogradov have proven that their only limitation is their imagination and creativity as they rack up musical accolades, including Musical America’s New Artist of the Month in May 2017. This performance, presented by Da Camera of Houston, marks Russian Renaissance’s Houston debut. Ahead of their travels to the Lone Star State, we chatted with the ensemble to learn more about their instruments and innovative approach to music choice. Q: How do you describe the balalaika, and what sets it apart from other string instruments? A: The balalaika is a Russian musical symbol with a unique shape. In fact, its appearance is one of a kind and not found anywhere else in the world. In our ensemble there are two types of this musical instrument: The balalaika prima (high range), performed by Ivan Kuznetsov, and the balalaika contrabasso (low range), played by Ivan Vinogradov. The balalaika prima has three strings, two of which are the same. This allows the musician to play chords in close proximity but reduces the range. That limited tessitura creates difficulties for transcriptions, for example, when translating works original to the violin. The way the balalaika sound is made—tremolo, vibrato, flaps and other techniques—is available on other musical instruments, but since everything on the prima balalaika is played with the fingers and without a pick, the sound is quite different. When Russian writer Alexei Tolstoy heard the balalaika, he said that if you move away just a bit from the instrument, it sounds like a choir singing quietly. Q: Tell us about your ensemble’s domra—it’s not an instrument many people here are familiar with. A: The domra has a rich and tragic history. It’s the oldest Russian multi-string instrument, the predecessor of the balalaika. Until the middle of the 17th century, the domra was widely used in Russia. But on the orders of Tsar Alexei Mikhailovich in 1649, who considered the domra to be a “demonic” instrument, the musicians were persecuted, and the instruments themselves were collected on the banks of the Moscow River and burned. In the 19th century, the domra was revived and a new, improved version was developed. Today, they’re made by skilled craftsmen usually out of different types of wood, including black ebony and spruce. In our ensemble we have two types of domra: a soprano and an alto. Q: Why is there renewed interest in these instruments? A: Interest in these folk instruments increased when they became musical symbols of the working people in Soviet Russia. Q: What process do you use to transcribe music written for other traditions and ensembles to your ensemble’s unique combination? A: Alexander Tarasov (button accordion), who is the author of most of our arrangements, brings his in-progress ideas to rehearsal so we can play through them and refine them before we present them in a public setting. Sometimes this process takes many months. As musicians with different experiences, we combine our strengths to give these arrangements a variety of flavors. It’s very important for us to mix different genres, because we consider music to be a universal language of communication, without borders and limitations. Q: What types of music inspires you? A: We’re all inspired by different types of music, so this is a hot topic of discussion among all of us! Everyone wants to play music of different cultures and types. Through healthy discussion, we find music that excites all of us despite our personal preferences. It’s part of our chemistry. What we have in common is that neither of us wants to limit the ensemble to a single genre. Q: Your have an original composition on the program entitled Vanya. What’s the story of this work? A: As its foundation, we took a piece by A. Arkhipovsky for solo balalaika. Ivan Vinogradov suggested rewriting it as a duet, where two instruments complement and challenge one another. Ivan Kuznetsov suggested adding a bit of rock and Alexander Tarasov suggested using a song by the Red Hot Chili Peppers. Q: Do you plan on writing more original works for the ensemble? A: Yes, we want to include more original music, but it is very difficult to do. We would like living composers to write more for our ensemble and our musical instruments. Q: How has your life changed since winning the Grand Prize at the 2017 M-Prize Competition for chamber music performance? A: The M-Prize Competition is really an amazing competition. In our opinion, the best chamber music competition. We think that this competition gave a tremendous boost to the development of our quartet. Da Camera presents Russian Renaissance on October 23, 7:30 pm. at Stude Concert Hall at Rice University. Tickets can be purchased online or by calling 713-524-5050.